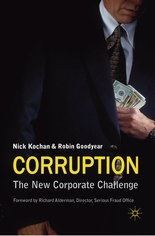 Nick and Robin aren’t lawyers or accountants and their book brings a new perspective to the issue of corruption looking at corporate strategy and compliance. Nick Kochan, who is a seasoned author, counts titles devoted to BCCI, Money laundering and Gordon Brown to his name and is often linked with exposes. To produce this book the authors conducted extensive interviews with senior figures in law enforcement, academics and lawyers. The result is a book which is jammed full of useful analysis and commentary on the challenges which face business, examples of how unscrupulous bribe takers devise bribery schemes and stories of what happens to the bribe payers when uncovered. Interested in understanding how we got here? The book has a neat introduction which puts the current global crackdown in context and includes a short overview of the UK legal regime. The section which is most useful is Part III which deals with the corporate response. In the section dealing with geographic risk some old favourites get a specific look, Indonesia, Iraq, Angola, Bangladesh and the Gulf states. Likewise, telecommunications, food, construction, healthcare, sport defence and the extractive industry also fall under the microscope. Examining these lists and you could be forgiven for thinking that no industry is clean. The book is available in hard copy GBP £19.76 and on Kindle GBP £17.78 from Amazon. It’s worth adding to your collection if you are compliance officer and a great reference if you are a corporate officer. All in all the book is a good read and easy page turner with a nice practical perspective. We recommend and it gets five star reviews on Amazon. What more do you need to know!